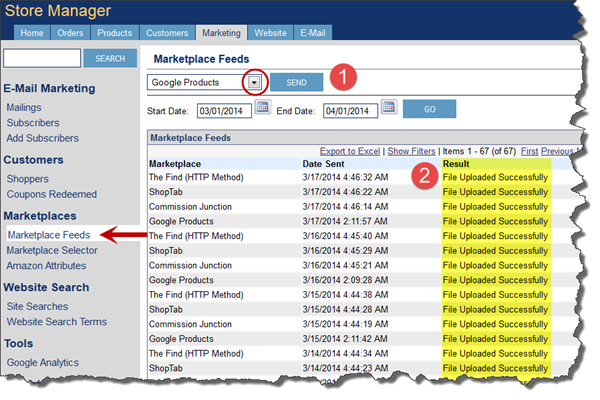 Store Manager's Marketplace Feeds page is where you can get the status of the latest feeds you've sent as well as send a feed manually when necessary. You can find this page by going to Marketing > Marketplaces > Marketplace Feeds in Store Manager. Sending a feed manually couldn't be easier. Simply select the feed from the dropdown at the top of the page and hit the Send button. Store Manager will immediately create the feed you selected and either make it available for download from the manager.modernretail.com website or FTP it over to your chosen marketplace (which method is used depends on the marketplace and how it was configured). By looking in the Result column you can see if the creation of your marketplace feed was successful. Typically, Modern Retail configures feeds to be sent nightly to the marketplace, but as noted above you can always send one manually.